THIS MAY, JOIN TIME LIFE AS THEY SET SAIL FOR HILARITY WITH DON RICKLES' CLASSIC U.S. NAVY SITCOM -- NEVER BEFORE AVAILABLE ON ANY FORMAT! Fairfax, VA (March 19, 2015) - This May, the TV DVD archivists at Time Life invite home audiences to enlist for high seas hilarity and military madness with a never-before-released television classic: CPO Sharkey: The Complete First Season . Previously unavailable on any format, the '70s-era sitcom was a showcase for iconic comedian Don Rickles, who played U.S. Navy Chief Petty Officer Otto Sharkey, an abrasive, sharp-tongued veteran in charge of a company of new seaman recruits on a San Diego naval base. Setting sail on May 19 and sure to thrill any fan of classic comedy or television, the 3-disc set ($29.95srp) will feature all 15 30-minute long episodes from Season One, along with a special Johnny Carson clip from "The Tonight Show". After serving in the Navy during WWII in real-life, the legendary Rickles found a perfect vehicle for his inimitable brand of comedy with CPO Sharkey , a satirical look at Navy life which ran on NBC for two seasons and 37 episodes (1976-78). As a 24-year naval veteran, Otto Sharkey had pretty much seen and heard it all. The unseasoned recruits he whipped into shape received most of his wisdom, though sometimes it was served up as sharp-tongued, ethnic barbs: there was Daniels (Jeff Hollis), an African-American, the Polish Kowalski (Tom Ruben), the Jewish Skolnick (David Landsberg), Mignone (Barry Pearl), an Italian-American and Rodriguez (Richard Beauchamp), a Puerto Rican. And, though the men of Company 144 were bunglers and blockheads, they were his bunglers and blockheads -- ready, willing, and able to endure one verbal Shark attack after another. Beneath his barbed exterior, however, there was a heart of gold and Otto helped his recruits survive boot camp and life with equal measure. Sharkey was joined on base by his best friend, Chief Dave Robinson (Harrison Page), his assistant, Seaman Lester Pruitt (Peter Isacksen), a 6' 7" Southerner filled with simple-minded homilies and his immediate superior, the smug, buck-toothed Lt. Whipple (Jonathan Daly). 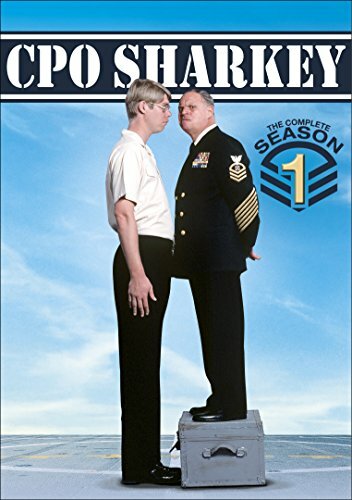 In CPO Sharkey: The Complete First Season , Sharkey often goes above and beyond the call of duty. He quells a boot camp mutiny brewing in his group, intervenes as a marriage counselor for a disruptive new recruit, and heads south of the border to Tijuana to spring his guys, who were thrown in the slammer for cheering the bull at a bullfight. Aside from the uncut episodes, the DVD will include a special extra: a legendary '70s clip from "The Tonight Show" featuring Johnny Carson storming the CPO Sharkey set.